Thick or curly hair often has a rough texture. That texture can be a real beast to style. Many women throw their hair into a ponytail or bun in the hopes that they can just hide it. Women can get extremely frustrated with their coarse hair. It’s definitely understandable. Coarse hair can be incredibly dry and prone to stubbornness. It just won’t do what you want. Instead of trying to ignore your coarse hair, you need a styling option that makes your hair manageable. Your hair doesn’t have to be an eyesore that you toss back into an elastic. The dream of many women with coarse hair is to have silky hair that is soft to the touch. That’s perfectly achievable with the best flat iron for coarse hair. Here I’ve reviewed 5 of the best choices for your hair type. Any one of these will help you achieve your dream of silky smooth hair. This flat iron has floating ceramic and tourmaline plates. Along those plates, this straightener has 8 micro-sensors to distribute heat. When heat is regulated through the whole plate, you’ll spend less time. Less time also means less heat on your hair. It reduces the amount of heat damage you’ll experience. The heat is adjustable. It has a huge range of temperature options. The heat ranges from 140 degrees F to 450 degrees F. With that range, you can pick a heat that works perfectly for your hair. Even at high temps, the ions from the tourmaline actually heal your hair. The flat iron heats very quickly, too. It’s a flat iron that you can take with you on vacation or work trips. It has dual voltage of 110/220 for worldwide use. The cord is one that professionals would envy. It’s a swivel cord that will spin 360 degrees. That will make it easy to style your hair when flipping from one side of your head to the other. The cord is really long, too. HSI included some really great extras with their flat iron. There’s Argan oil for protection. It’s very important to protect your hair from heat damage. It’ll also smooth them to a shiny gloss. They’ve included a style guide in case you want to straighten then curl your hair. There’s a heat glove and a travel pouch, too. The plate materials are the best for straightening coarse or curly hair. Between the ceramic and the tourmaline, you’re getting extra shine and smoothness. It’s amazing when your hair looks better after applying all that heat. Travel options are great. We want to have beautiful hair even when we’re on work trips. Vacation hair can be straight and beach wavy at the same time. There’s the dual voltage for travel as well as the long, swivel cord. You can’t predict how far the socket will be from a mirror in a hotel room. They provide a sample product to protect your hair from the heat. In case you don’t have your own, Argan oil will work to smooth your hair and protect it. I’d recommend you pick up some more for every time you style. The temperature control is inside the flat iron handle, which can get really hot. The G2 is an improvement on an already great product. CHI is a name that most women know regarding hair straighteners. The G2 has a ceramic floating plate that has been infused with titanium. That makes it stronger and increases the durability of the plates. The titanium also infuses hair with a smooth shine. It has varied temperature settings for certain hair textures. The texture of your hair will be the influence behind the temp setting. There’s an LED display on the device. The LED light is color-coded to indicate the temperature setting. From 0 – 370 degrees F, you’re going to see a blue light. Green light indicates 375 to 395 F. Red is 400 to 425 degrees F.
Each setting is for a different hair type. Blue is the lowest and that’s for thin or fragile hair. Green is for medium hair texture. Red is for thick, coarse or curly hair. The highest setting is good for hair that is resistant to straightening. It tops out at 425 degrees F, which is a high heat for coarse hair. The straightening iron performs the duty named in its title. It also does much more. The iron can be used to create curls after you’re done straightening. Your curls will be smoother and tighter when using this device. It can help you achieve beach waves and other trending hair styles. This straightening iron has professional features, but it’s still easy for the home user to handle. It’s flexible enough to use for many hair types, too. You can purchase this for your unique styling challenges and still let friends or family borrow the straightener. The titanium-infused ceramic plates will give you a luxurious shine. The titanium ensures that the plates will be virtually indestructible. That’s important when you’re getting a lot of styling product on the plates. And you should definitely be using heat products on your hair to avoid damage. The color-coded LED light indicator is an easy way to see the temp. All you need to know is the color your hair needs for it to work. Green and red are a range of only 25 degrees, but that matters when you have coarse hair. You’ll want that extra heat to straighten properly. This straightener does not have an automatic shutoff, so you’ll need to be aware and turn it off every time. Like tourmaline flat irons, titanium generates negative ions. The titanium flat iron is lightweight and this one is ultra-thin. The titanium plates generate heat quickly and distribute it evenly across the material. That stops you from experiencing damage from uneven heat. It’s vital for coarse hair when you want the sectioned hair to straighten evenly. 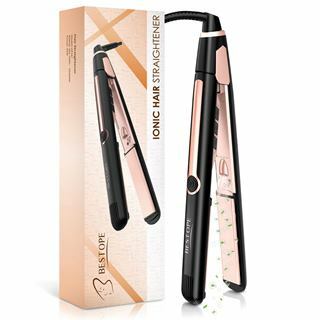 The ions in titanium straighteners will give you healthier hair than one without negative ions. They infuse the hair strands with moisture that helps fight against damage. It’ll leave your hair shiny and healthy after use, too. 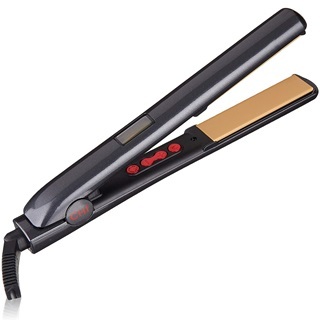 This straightener uses a Ryton casing to keep the outer bits safe to touch. Most people will hold the straightener in one hand and press the plates down with the other. The housing makes that a safe practice. You won’t have to buy yourself heat gloves to straighten your hair. 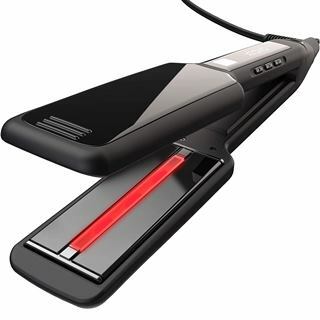 There are 50 heat settings available with this flat iron. The low setting is 1-8, which is for thin hair that’s pretty fragile. Medium is 9-14 for medium hair that doesn’t need much straightening. Med-high is 15-20. That’s for thick hair that’s wavy but not coarse or resistant. High is 21-25 for hair that’s considered hard to straighten. That could be used on coarse hair. Maximum is 26-30 is for hair that’s incredibly resistant. Level 30 would be the highest, 450 degree F setting. The best part of this flat iron is the titanium plates. They’re very smooth and won’t snag or pull your hair. It’s a professional iron that is easy for anyone to use. The 50 heat settings are easy to dial, and it’ll be a simple matter to dial in the exact heat you need. This flat iron is easy to hold. It’s light, ultra-thin, and the casing won’t get too hot. You could be holding this for an hour while you style your hair. It should be simple to hold and light. You don’t want a hand cramp while trying to style your hair. It’s a good flat iron for straightening as well as adding curls and waves. 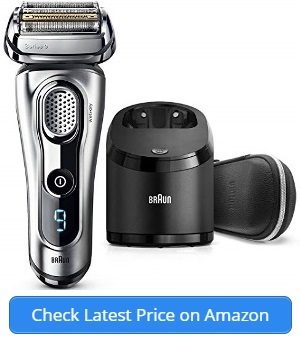 It heats very quickly, so there’s not a ton of downtime while you’re waiting to do your hair. Doesn’t have international voltage for travel. The Xtava flat iron has an interesting design. The ceramic tourmaline plates are 2 inches wide. In the middle of the bottom plates is an infrared element. This element uses infrared heat to heat the interior of the hair shaft. Heating the inside means less damage on the outside. The tourmaline in the plates also uses ions to introduce moisture to the hair. The plates are floating, which provides a huge benefit to your hair. You can take big sections of hair to straighten. The floating plates will move as needed to stay in contact with your hair. That flex grip work in any position. With fixed plates, you’re getting plates that don’t always meet. The iron has 10 temperature settings visible in an LCD display. The display will show a range in temperature from 265 degrees F to 300 degrees F. That’s for fine hair. It will show 300 F to 380 F for medium hair. Thick coarse hair will use the 380 F to 445 F temperature. The device heats to those temperatures quickly, too. It’ll happen in 90 seconds. 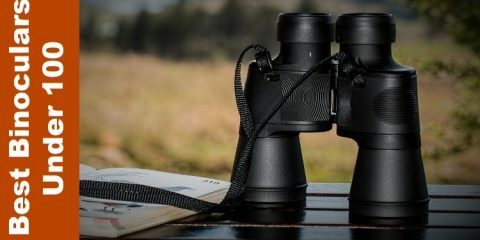 With the Xtava, you’re getting extra features. There’s an 8-foot cord for free movement while you’re styling. The rapid heating technology that was already mentioned. It’ll heat up in 90 seconds. There’s also an auto shutoff. After 60 minutes the device will automatically shut itself off. My favorite feature of this product was hard to pin down. There are more than a few great things about it. There’s the rapid heating. It doesn’t take long to section your hair once you’ve done it a few times. You want a device that’s ready and waiting for you. You don’t want to be the one waiting. This feature will have you out the door so much quicker. The auto shutoff is also another fantastic feature. You’ll never have that moment of panic at work when you wonder whether you’ve shut down the flat iron. It’s dangerous to leave a device like a flat iron on all day. It could cause a fire or burn someone who touches it unaware. The infrared technology is a unique feature. With thick, coarse hair, getting inside the hair shaft with the heat makes sense. 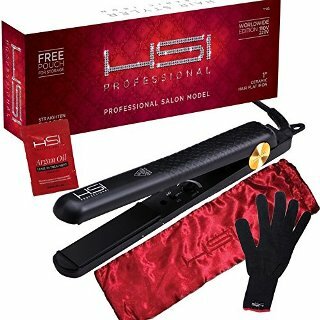 It will heat quicker, straighten faster, and lock in your style. With the high heat and infrared technology, resistant hair won’t stand a chance. The outer casing can get extremely hot. You’ll need to purchase a glove with this one. The flat iron has ceramic 1-inch plates. They’re 3D floating plates that will move as needed based on the thickness of your hair. That’s important for thick, coarse or curly hair. Otherwise, you’ll be standing there for hours taking small sections of hair. The plates will reach an ideal temperature for straightening. The outside of the case will stay cool to the touch. While the ceramic plates don’t produce ions, there’s an anion emitter. The hair is pulled through the plates. At the same time, tourmaline technology is releasing negative ions. That gives you smooth, shinier hair after straightening. Your hair can go in coarse and frizzy. 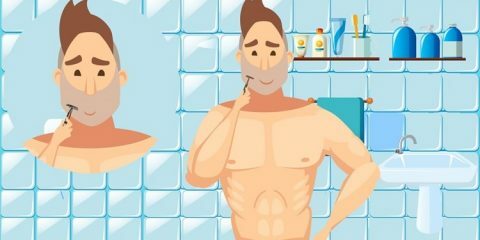 On the other side of the process, you’ll have shiny, healthier-looking hair. The temperature setting goes by the type of hair that you have. There’s a setting for thin fine hair, or hair that’s damaged. That setting is 265 degrees F to 300 F. Fine, strong hair can go a bit higher in heat. That setting is 300 F to 340 F. Normal hair that’s a bit damaged will be set at 355 F. Normal, resistant hair’s setting is 375 F to 410 F. Thick hair can be set at 430 F. Thick, coarse and resistant hair can be set at the highest temp of 450 F.
This slim flat iron can be taken with you on the road. To a friend’s house overnight, travel to another country for vacation, or work trips. The flat iron can go everywhere with you. It has worldwide voltage. You don’t need to purchase a converter or extra plug, either. It will automatically switch between 100V and 240V as needed during your travels. As far as the plates, the ceramic plates with negative ion emitter is unique. If you love ceramic plates, but want the ions generated by tourmaline, this is great. It’ll give you the best of both worlds. The negative ions will introduce more moisture to your hair. That moisture will make your hair much healthier. The device will heat up to 355 degrees in 30 seconds. That will give you enough time to section your hair and get ready to straighten. On the LCD screen, you’ll see the exact temperature. That will ensure that you’re not using too much heat for your hair type. On the outside of the casing, there’s a small rubber grip. It’s made of silicone and rubber. That’s in a good spot for holding your flat iron. The outer part of the casing won’t be too hot to hold, either. These are small things, but they make a huge impact on your styling. The off button is easy to bump when you’re straightening due to its placement. 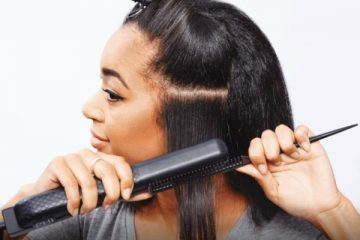 Your hair type will influence the type of flat iron that you purchase. Thin, fine hair doesn’t need high temperatures to tame it. Hair that is damaged should not have high heat applied to it. Coarse, curly hair is harder to tame. That should influence the type of flat iron that you purchase. You’ll need to go into your assessment with your hair texture in mind. Your friend with fine hair is not going to be able to recommend a good straightener for you. The material of your flat iron will have a direct impact on how it straightens. Each material should focus on a certain type of hair type. Those with fine or medium hair texture can use a ceramic straightener without a problem. There’s also titanium flat irons. The titanium material works well with hair that’s coarse. It holds the heat more evenly. That allows thicker hair to slide easily. Tourmaline is good for frizzy hair that’s been damaged. Tourmaline uses negative ions while straightening to add moisture to the hair. Negative ions are good for most hair types. Some ceramic and titanium irons have material blended into it to get ions working. Many women believe they need an iron with the highest heat setting possible. For some women, that is true. It’s not true for everyone, though. Those with thin hair don’t need high temps. It could damage the hair. Thin hair should be at the lowest setting possible that still produces results. Medium or damaged hair needs a medium amount of heat. It’s coarse, curly hair that requires high temperatures. It’s the hardest hair to straighten since it wants to resist the flat iron. The plates of a flat iron are flat, but the edges are where you’ll see variety. The edges of the straightener might be hard edged or rounded. With rounded edges, you can get a curl going with your straightener, too. It becomes a dual styler. The length of the plate will help make the process faster. 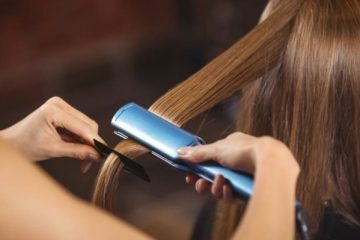 You’ll be able to section off bigger chunks of hair for straightening. If you have fine hair, you don’t need long plates. It doesn’t distribute the hair as evenly. Women with thick, coarse hair will want to look for longer plates. With every flat iron, you’ll want to invest in the best plate materials. The extra features matter, too. A flat iron with an automatic shutoff will save you energy and make your home safer. Many flat irons don’t have a casing that’s cool to the touch. Extra features like gloves will keep you from being burned. Other features might include a smoothing or heat product to protect your hair. If that isn’t included, you’ll want to purchase your own. Dual worldwide voltage might be a concern if you’re traveling with your straightener. 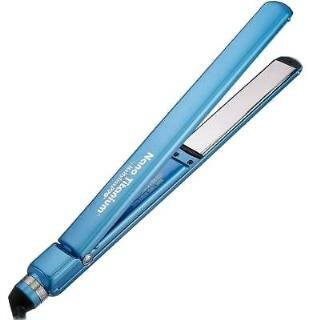 The best flat iron for coarse hair will be the one that has negative ions. Those negative ions will help make your hair glossy and healthier-looking. A wide plate is often better for coarse hair if it’s thick. Keep that in mind while shopping. I’d recommend any of the products on the list. They were gathered onto this list based on their reliability and how they tame the coarsest hair. You really can’t go wrong with any of these flat irons. They’re great for straightening as well as curling or giving your hair beautiful waves.